The Lowell Spinners are proud to serve the community of the Greater Merrimack Valley and the region of Southern New Hampshire. Since our inception in 1996, we have been dedicated to bringing affordable family entertainment to over three million (that's 3,000,000!) fans. We invite you to come and join us at beautiful LeLacheur Park as we continue our voyage "On The Road To Fenway". In 2019 the Spinners will celebrate their 24th season in the Merrimack Valley! More recently, the team was nominated for Minor League Baseball Promotion of the Month for their Pete Frates Bobble Ice Bucket Giveaway/ALS Awareness Night. In 2013, the Spinners were awarded the Minor League Baseball Golden Bobble Head Award for the "Best Theme Night" Promotion in all of Minor League Baseball for their Military Hero Card Set promotion. In 2010, the Spinners staff were the winners of the NY-Penn League nomination for Minor League Baseball's Larry MacPhail Promotional Trophy. They were also named the winners of the NY-Penn League's MacPhail nomination in 1999, 2000, 2006 and 2010, while earning the NYPL's Pinckney Award nomination in 2011. 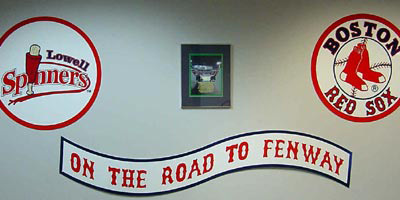 Most notably, the staff was honored with Baseball America's Freitas Award and Minor League Baseball's MacPhail Promotional Trophy, and The Boston Baseball Writer's Achievement Award in the year 2000. The Spinners front office staff helped set a new franchise attendance record in 2010 when 202,209 fans showed up (it didn't hurt that we played one game at Fenway Park, but we'll take it). The Lowell Spinners are dedicated to creating lifelong memories in a family oriented environment at affordable prices, ensuring safety, cleanliness and customer service through Minor League Professional Baseball.